Trying to green your building or business? Not sure where to start? Choosing to clean green is the perfect first step. Enlisting the help of a green cleaning service is an excellent way to go green and maximize your business’ and building’s overall sustainability. At GBS, our mission is to help you go green! Check out the article below to learn why green cleaning is such an integral part of becoming USGBC LEED certified and running a green business. Because of the environmental and human health benefits associated with cleaning practices, the LEED© for Existing Buildings (LEED-EB) Rating System has incorporated credits that reward green cleaning. 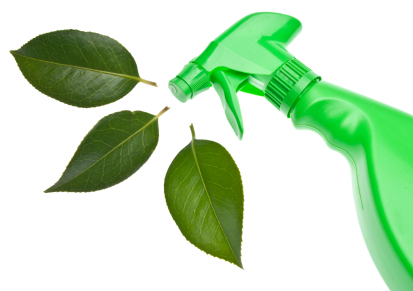 Green cleaning provides an excellent opportunity for enhancing a building’s sustainability without expending large sums of money, and is a good start point for greening up your building. The following article considers the benefits green cleaning and the process of implementing a green cleaning program, with insights from Stephen Ashkin, President of the Ashkin Group and member of the USGBC’s LEED-EB Committee. The Ashkin Group is a consulting group that promotes and provides services for green cleaning (www.ashkingroup.com). A major benefit of green cleaning is that it minimizes the environmental and health concerns associated with conventional cleaning practices. Many traditional products are derived from non-renewable natural resources and can be toxic to human health and cause long-term environmental problems. It is critical to recognize that the solution to these problems is not to clean less, as cleaning is essential to protecting occupant well being and safety. Rather, the solution is the selection and use of appropriate cleaning and maintenance products. Using cleaning technologies that utilize rapidly renewable derived resources without sacrificing quality, performance, or adding additional cost has tremendous life cycle advantages. Cleaning products can contribute to indoor air quality problems as volatile organic compounds (VOCs) evaporate and are circulated through the building’s ventilation system. Cleaning products can also leave residues that cause eye and skin irritation, can be absorbed through the skin to affect health, can be accidentally ingested to cause poisoning, and can be inadvertently mixed to cause fatal gases and fires. These risks affect the health of building occupants and cleaning workers. Cleaner, safer, healthier buildings boost occupant health and productivity, making green cleaning a sound investment. Nearly 3.5 million cleaning industry employees in the US are exposed to chemicals and other materials while cleaning and maintaining buildings. Ashkin notes the seriousness of this exposure from a health standpoint, because “many of the older technologies still being utilized in our buildings are formulated using ingredients that are carcinogenic, reproductive toxins, endocrine modifiers, respiratory irritants, and persistent bioaccumulative toxins.” LEED-EB addresses the human health dangers associated with cleaning by promoting safer, environmental preferable cleaning products and appropriate training for product users. Once used, cleaning products contribute to air pollution by releasing volatile organic compounds into the air through evaporation. This affects indoor air quality, leading to health problems in building occupants, and also contributes to fog in outdoor air. The use of cleaning products can also contribute to water pollution. Although wastewater treatment systems typically remove chemicals found in cleaning products, inadequately treated water containing cleaning products can be toxic to aquatic species. Also, products containing phosphorus or nitrogen contribute to nutrient-loading in water bodies, lowering water quality (EPA Guide for Federal Purchasers—Greening Your Purchase of Cleaning Products, www.epa.gov/oppt/epp/documents/clean/cleaning.htm). Because demand and technology for green cleaning products is growing, in most cases green products are comparably priced with convention products. Any additional investment in green cleaning supplies and equipment is quickly offset by the economic benefits associated with their reduced impact on human health. Custodial workers suffer a high number of injuries in comparison to other job categories, and many of these injuries are a result of exposure to hazardous cleaning chemicals. Green products reduce worker’s compensation by lowering injuries, as well as owner liability. Green cleaning practices can also reduce turnover among custodial workers, as a portion of turnover is related to individuals leaving the profession in order to reduce their exposure to toxic chemicals. Another economic benefit is related to occupant productivity. By replacing products that negatively affect indoor environmental quality, the health and productivity of all building occupants is improved. This reduces absenteeism and health care costs, and improves worker productivity, which leads to increased profitability. Three of the five credit categories in the LEED-EB Rating System include credits pertaining to green cleaning products and practices. These standards can be used as a roadmap for integrating a comprehensive green cleaning plan in your building. View summaries of LEED-EB green cleaning credits below, or download the entire LEED-EB Rating System online. This credit offers up to 2 points for an exterior site management plan that includes, among other things, developing a policy for sustainably cleaning and maintaining the building exterior. This credit offers up to 3 points for the implementing a purchasing program for cleaning materials and products, disposable janitorial paper products, and trash bags that meet sustainability criteria. This credit offers 1 point for the use of entryway systems (grills, grates, mats, etc.) that reduce the amount of dirt, dust, pollen, and other particles entering the building, and for the use of cleaning strategies to maintain entryways and exterior walkways. This credit offers 1 point for the proper isolation of janitorial closets. Isolation measures include deck-to-deck partitions with separate exhausting, no air re-circulation, negative pressure in all closets, and hot and cold water and drains plumbed for appropriate disposal of liquid wastes. This credit offers 1 point for the adoption of a green cleaning policy. The policy should include the use of sustainable cleaning systems, sustainable cleaning products, chemical concentrates and dilution systems, programs for the proper training of maintenance personnel, hand soaps not containing antimicrobial agents excepts where required by code, and cleaning equipment that reduces impacts on IAQ. This credit offers up to two points for the development and implementation of an integrated indoor pest management policy that minimizes the use of toxic pesticides. Unless you’re an expert on the subject, try to identify vendors or service providers that have experience with green cleaning. This is a lot easier than trying to teach them (the vendors). Experience with LEED-EB and the green cleaning “roadmap” it offers is a real plus. Before starting your program, determine your starting point by conducting a simple audit. This will help you recognize all opportunities for improvement and build a better plan. Also, as part of your plan you may need to evaluate your cleaning budget. Unfortunately, you may be paying the same amount per square foot as the building next door, but many are only paying for acceptable appearances and minimal tenant complaints. Today, while green cleaning products and services are competitively priced compared to traditional products, you may find that you need to invest more in cleaning to achieve the health, performance, productivity and other potential benefits to be had. Please consider it – you may find an outstanding return on the investment. Recognize that while simply switching to a few “green” products or equipment is a good thing, this is not enough. For best results, implement a comprehensive program that includes the chemicals, paper, equipment, entry mats, tools, etc. And keep in mind that 80% to 90% of the cleaning budget is labor, so don’t forget training and winning the “buy-in” from your janitorial staff. Remember, change is hard and the people on the ground level can make or break your program. The real objective of a green cleaning program is to help us become “stewards” of our buildings – caring not only for the structure, materials, finishes, office equipment, etc., but ultimately ensuring the wellbeing of the people in our buildings. Being good stewards requires that individual occupants recognize and take responsibility for their actions. For example, by properly separating their recyclables from the trash, or minimizing crumbs and other food sources that attract pests. Education and ongoing communication is essential to help everyone recognize that unless we each do our part, we can’t create the healthiest, most productive building with the least environmental impacts.